A new NASA illustration shows the full scale of the sun’s wondrous magnetic fields, giving not just scientists but the general public a fresh understanding of how the sun’s magnetism works. The magnetic field of our sun is constantly changing with the star’s surface and internal movements. Magnetic fields twist and loop into the solar atmosphere, but they remain invisible to the naked eye. 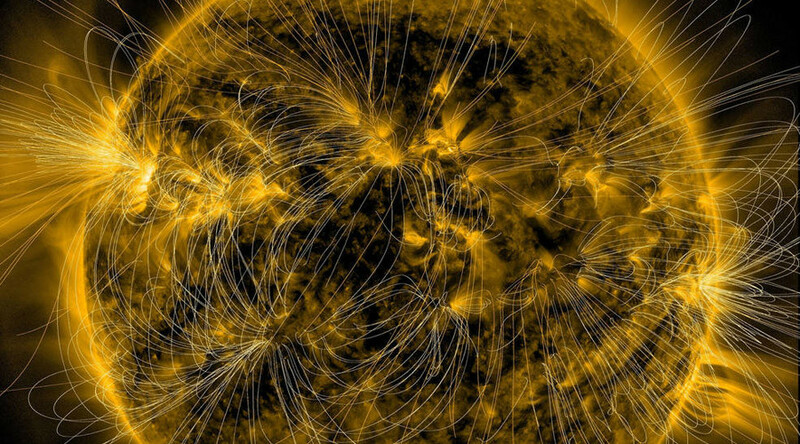 But an image taken by NASA’s Solar Dynamics Observatory, overlaid with a model of the sun’s magnetic measurements, has shown the fields in a detail never seen before. The new image has brought scientists one step closer to understanding where exactly magnetic field is created by highlighting where fields are densest and how they link to the sun’s most active regions. The sun’s powerful magnetic fields have huge influence over “space weather” on Earth, like auroras, and learning its magnetic system is crucial for understanding the nature of space throughout the solar system.